What are bonsai pruning and trimming? They are techniques of removing unnecessary shoots, foliage, and branches of trees. While being used interchangeably, these two terms have slightly different context meanings. Trimming is to remove small plant components like shoots, leaves, twigs, and small branches while pruning usually indicates a big cutting of large branches. Ppruning and trimming have several important roles in bonsai art. First, the activities help bonsai growers shape and maintain bonsai in a desired form, or bonsai style. Secondly, such methods reduce growth above ground to balance with growth of root system under ground. Removing leaves means that less foliage the roots need to support. For trimming foliage and light branches, bonsai growers use sharp scissors, or shears. This traditional tool is called butterfly shears or bonsai shears. If you want to cut heavier branches (bonsai pruning), you might need a concave cutter. Some trees such as junipers or cedars should be trimmed by figure pruning. That is using your thumb and index figure to pinch new growth and to avoid unsightly browning and a “sheared” appearance. You can easily find all bonsai pruning tools in bonsai stores, or even buy them online. Bonsai hobbyists frequently remove unnecessary branches and leaves to maintain as well as refine the desired shape and style of their trees. Botanically, trees have a natural mechanism, called apical dominance, to grow towards unoccupied spaces, which are usually at higher and outer positions. Lower and inner branches and foliage thrive less and may be gradually weakened, even dead. In many cases, above-mentioned development process goes in contrary to the expectation of bonsai growers. They want bonsai trees to maintain shape and should not grow higher or broader any more. Thus, it’s necessary to regularly prune and trim branches, leaves, and shoots that have outgrown the intended size and shape of canopy. Unlike maintenance pruning, style pruning relates removal of large branches. Thus, to certain extent, it likely changes bonsai structure and form of bonsai trees. In this process, bonsai growers have to choose which branches to keep and which one to get rid of. It is crucial step, because it’s an irreversible action, and it decides how the tree will look like. Perhaps, every bonsai beginner feels awkward in the first time practicing pruning technique. They just don’t know which branch should be removed. The advice is, if you still have any doubt about cutting a branch or not, just leave it there. Do more research and come back when you’re ready with your decision. 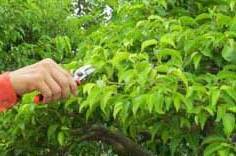 Of course, there’re several general principles to consider in pruning branches: faulty branches should go. If two branches occur at the same height of the tree, keep one of them and remove the other. If two adjacent branches point towards the same direction, keep one of them and remove the other. Remove disproportionately thick branches from the top of the tree, as branches at the bottom should be thicker than at the top. Trees should be style-pruned in the early spring or late autumn, just before and after the growth season. After structural pruning, you should put the tree in the shade and out of the wind. Fertilize as you would do normally and let the tree recover from the training for at least a few months. Bonsai is a rewarding hobby and bonsai pruning is one of fundamental bonsai techniques to help you train your trees. Keep doing it regularly and you’ll improve your skills to an advanced level.